Instant downloads of all 942 LitChart PDFs (including Jonathan Livingston Seagull). 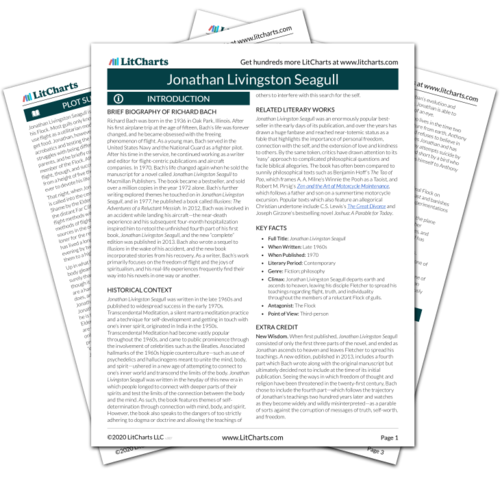 Welcome to the LitCharts study guide on Richard Bach's Jonathan Livingston Seagull. Created by the original team behind SparkNotes, LitCharts are the world's best literature guides. A concise biography of Richard Bach plus historical and literary context for Jonathan Livingston Seagull. A quick-reference summary: Jonathan Livingston Seagull on a single page. In-depth summary and analysis of every Part of Jonathan Livingston Seagull. Visual theme-tracking, too. Explanations, analysis, and visualizations of Jonathan Livingston Seagull's themes. Jonathan Livingston Seagull's important quotes, sortable by theme, character, or Part. Description, analysis, and timelines for Jonathan Livingston Seagull's characters. Explanations of Jonathan Livingston Seagull's symbols, and tracking of where they appear. An interactive data visualization of Jonathan Livingston Seagull's plot and themes. Richard Bach was born in the 1936 in Oak Park, Illinois. After his first airplane trip at the age of fifteen, Bach’s life was forever changed, and he became obsessed with the freeing phenomenon of flight. As a young man, Bach served in the United States Navy and the National Guard as a fighter pilot. After his time in the service, he continued working as a writer and editor for flight-centric publications and aircraft companies. In 1970, Bach’s life changed again when he sold the manuscript for a novel called Jonathan Livingston Seagull to Macmillan Publishers. The book became a bestseller, and sold over a million copies in the year 1972 alone. Bach’s further writing explored themes he touched on in Jonathan Livingston Seagull, and in 1977, he published a book called Illusions: The Adventures of a Reluctant Messiah. In 2012, Bach was involved in an accident while landing his aircraft—the near-death experience and his subsequent four-month hospitalization inspired him to retool the unfinished fourth part of his first book, Jonathan Livingston Seagull, and the new “complete” edition was published in 2013. Bach also wrote a sequel to Illusions in the wake of his accident, and the new book incorporated stories from his recovery. As a writer, Bach’s work primarily focuses on the freedom of flight and the joys of spiritualism, and his real-life experiences frequently find their way into his novels in one way or another. Get the entire Jonathan Livingston Seagull LitChart as a printable PDF. Jonathan Livingston Seagull was written in the late 1960s and published to widespread success in the early 1970s. Transcendental Meditation, a silent mantra meditation practice and a technique for self-development and getting in touch with one’s inner spirit, originated in India in the 1950s. Transcendental Meditation had become vastly popular throughout the 1960s, and came to public prominence through the involvement of celebrities such as the Beatles. Associated hallmarks of the 1960s hippie counterculture—such as use of psychedelics and hallucinogens meant to unite the mind, body, and spirit—ushered in a new age of attempting to connect to one’s inner world and transcend the limits of the body. Jonathan Livingston Seagull was written in the heyday of this new era in which people longed to connect with deeper parts of their spirits and test the limits of the connection between the body and the mind. As such, the book features themes of self-determination through connection with mind, body, and spirit. However, the book also speaks to the dangers of too strictly adhering to dogma or doctrine and allowing the teachings of others to interfere with this search for the self. Jonathan Livingston Seagull was an enormously popular best-seller in the early days of its publication, and over the years has drawn a huge fanbase and reached near-totemic status as a fable that highlights the importance of personal freedom, connection with the self, and the extension of love and kindness to others. By the same token, critics have drawn attention to its “easy” approach to complicated philosophical questions and facile biblical allegories. The book has often been compared to sunnily philosophical texts such as Benjamin Hoff’s The Tao of Poo, which frames A. A. Milne’s Winnie the Pooh as a Taoist, and Robert M. Pirsig’s Zen and the Art of Motorcycle Maintenance, which follows a father and son on a summertime motorcycle excursion. Popular texts which also feature an allegorical Christian undertone include C.S. Lewis’s The Great Divorce and Joseph Girzone’s bestselling novel Joshua: A Parable for Today. Climax: Jonathan Livingston Seagull departs earth and ascends to heaven, leaving his disciple Fletcher to spread his teachings regarding flight, truth, and individuality throughout the members of a reluctant Flock of gulls. New Wisdom. When first published, Jonathan Livingston Seagull consisted of only the first three parts of the novel, and ended as Jonathan ascends to heaven and leaves Fletcher to spread his teachings. A new edition, published in 2013, includes a fourth part which Bach wrote along with the original manuscript but ultimately decided not to include at the time of its initial publication. Seeing the ways in which freedom of thought and religion have been threatened in the twenty-first century, Bach chose to include the fourth part—which follows the trajectory of Jonathan’s teachings two hundred years later and watches as they become widely and wildly misinterpreted—as a parable of sorts against the corruption of messages of truth, self-worth, and freedom. Tanner, Alexandra. "Jonathan Livingston Seagull." LitCharts. LitCharts LLC, 31 Jul 2018. Web. 11 Dec 2018. Tanner, Alexandra. "Jonathan Livingston Seagull." LitCharts LLC, July 31, 2018. Retrieved December 11, 2018. https://www.litcharts.com/lit/jonathan-livingston-seagull.